During a typical monthly menstrual cycle, a woman ovulates and her uterine lining thickens to prepare for conception. If pregnancy does not occur, the built-up tissue of the uterine lining is shed with the menstrual flow and a new cycle begins. Periods typically occur approximately every 4 weeks and last no more than 7 days. Sometimes, periods become especially heavy and last an unusually long time. Several things can cause heavy or prolonged menstrual bleeding. Possibilities include reproductive system problems and some nonreproductive disorders. Prolonged or heavy periods affect about 30 percent of American women of child-bearing age, according to a December 2007 "Current Opinion in Obstetrics and Gynecology" article. Women with a heavy flow may pass large clots and experience painful cramping. One or more noncancerous growths called uterine fibroids, or leiomyomas, are a common cause of heavy flow. These growths develop in the uterine wall and contain muscle and other tissue. Other noncancerous growths, called polyps, can develop on the surface of the uterine lining and also cause heavy, long periods. Although the cause of fibroids and polyps is not well understood, they become more common with age and tend to run in families. Treatments vary depending on the severity of the problem, but can include surgery or special procedures to remove or destroy the growths. Other problems with the uterus can cause prolonged or heavy periods. With a condition called adenomyosis, the lining of the uterus thickens and grows into the deeper, muscular part of the uterine wall. When this thickening turns into a mass that bulges into the uterine cavity, it's called an adenomyoma. These problems occur most often in women who have had children and are older than 30. Symptoms vary in severity and are controlled with hormonal medications or surgery. Cancer of the uterine lining, called endometrial cancer, is an uncommon cause of increased bleeding or prolonged periods. Bleeding between periods may also occur. Uterine cancer is treatable with surgery, radiation, chemotherapy and other medications. Disorders outside the reproductive tract may cause long, heavy periods. Type 1 diabetes is one example, report the authors of a study published in the April 2003 issue of "Diabetes Care." The researchers noted that these menstrual problems were about twice as common in mothers aged 20 to 30 with diabetes, compared to women in this age group who do not have diabetes. Although the reasons for the association between type 1 diabetes and heavy periods are unclear, the problem is often controlled with hormonal medications. Other conditions that may cause long periods include Hashimoto thyroiditis -- an autoimmune disease in which the thyroid gland is underactive -- and certain disorders of the liver and kidneys. In rare cases, a woman might experience especially heavy or long periods because of an underlying bleeding disorder that interferes with blood clotting. There are many types of bleeding disorders, including von Willebrand disease, in which a particular clotting factor is abnormal or made in low amounts. Other disorders can impair a woman's blood clotting and cause long periods, but these are also rare. Other symptoms of a bleeding disorder include easy bruising, frequent nosebleeds, and prolonged bleeding with everyday cuts and scratches. If you experience heavy or prolonged bleeding, changes in your period, or have vaginal bleeding between periods, see your doctor to determine the cause and appropriate treatment. 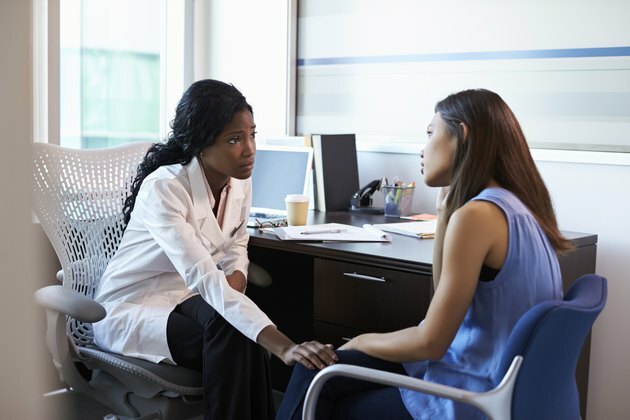 Seek immediate medical attention if you have very heavy or prolonged vaginal bleeding accompanied by dizziness, fainting, a rapid heartbeat, weakness, fever, or severe or worsening abdominal pain. Conservative Surgery for Menorrhagia; Peter O'Donovan, et al. What Causes Cramps & Brown Spotting?